The following is a listing of Uyuni hotels and hostels. Uyuni has the distinction of offering some of the most unique hotels in the world. Along the shores of the largest salt desert on Earth you'll find several luxurious hotels made entirely out of salt; even the furniture! Additionally there are other hostels and hotels in the city of Uyuni itself. Nights are cold in Uyuni. Choose warmth over a discount. If you’ve already found a hotel or hostel you love, or one you don't recommend, tell us in our Bolivia Hotel Review. Below is a list of hotels in Uyuni. Check for them on Tripadvisor and Trivago. If they aren’t listed, you’ll need to make a reservation directly. Sleep in an actual railcar! This hotel is situated very near the town of Quemado in San Pedro de Quemes, to the South of the Uyuni salt flats, and across from a peninsula. It is surrounded by majestic mountains, caves, and rock paintings. 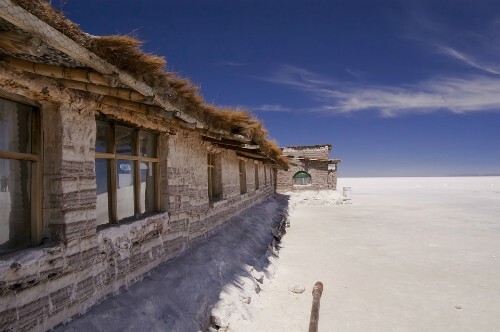 It is one of three Tayka hotels, the others being at the Salar de Uyuni (listed above) and in the Siloli desert (listed below). This hotel is located closer to Laguna Colorada and Laguna Verde (within about a half an hour), as well as the geysers and bubbly mud pools at Sol de Mañana. It's 220 Km from the town of Uyuni and 200 Km from Atacama Chile, still on the Salar de Uyuni. It is a part of the Tayka Hotels group.